Anker’s reader-favorite PowerCore battery packs run the gamut from tiny tubes that fit into your pocket to massive blocks of energy that can power your devices for days at a time. Today’s exclusive deal focuses very clearly on the latter. 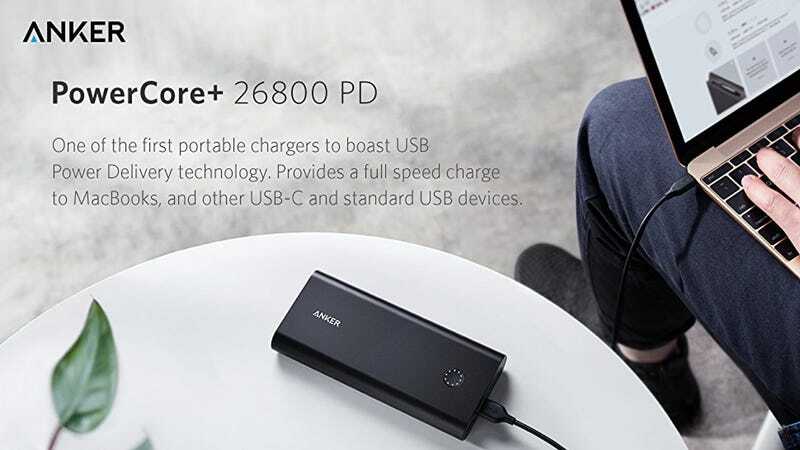 The PowerCore+ 26800 is one of the few battery packs on the market with USB-C Power Delivery up to 27W. That means it can charge a 12" MacBook at nearly full speed, a Nintendo Switch at full power while you’re playing Zelda on a plane, or an iPad Pro significantly faster than the charger it came with (if you have a USB-C to Lightning cable). Power Delivery works both ways too, so you can actually recharge the entire battery pack in just 4.5 hours with the included 27W USB-C wall charger, compared to over 11 hours with a standard 2A USB charger. When you’re trying to juice up before a flight, every minute counts. The PowerCore+ also includes two high speed standard USB ports that you can use simultaneously, which is good, because this thing has enough power to share. We had a hands on with the pack when it launched back in April, and you can see our impressions here. This battery cost $100 at launch, and has been selling for $110 as of late. Our exclusive $88 deal is the first promo code they’ve ever offered on this pack, and an all-time low price, so if it’s been on your wish list, don’t hesitate.